​For many cyclists across Pennsylvania, riding a bike is more than just a hobby — it's their primary mode of transportation. Whether it's cost savings or saving the environment, there are plenty of reasons why Pennsylvanians may choose to commute by bicycle, and PennDOT is here to support them with an increased focus on safety and mobility for cyclists during our planning processes. 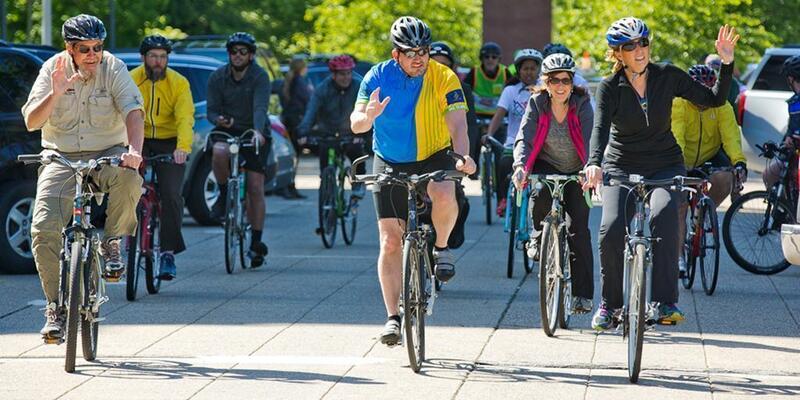 "We want to establish and update goals, objectives, and performance measures while offering guidance to local planning partners in setting priorities and developing bicycle and pedestrian plans," said PennDOT Secretary Leslie S. Richards during the department's annual Bike to Work Week event on Monday, May 15. "Our overall goal is to integrate pedestrian and bicycle activities into our transportation network rather than have them be an afterthought." Philadelphia saw 2.2 percent of its workers commuting by bicycle, according to the U.S. Census Bureau's American Community Survey 2015 1-Year Estimate. Pittsburgh had a rate of 1.7 percent. Overall in Pennsylvania, there was an increase of more than 100 percent in the rate of people commuting by bike from 2005 to 2013. Bike to Work Week (May 15-19) and Bike to Work Day (May 19) are a time to highlight the benefits of commuting by bicycle. During Monday's event, representatives from PennDOT, the Department of Conservation and Natural Resources, the Department of Environmental Protection, the Department of Health, and the Department of Labor & Industry, along with other officials and staff, participated in a bike ride around the Capitol complex. "Pennsylvania is smart to invest more in multimodal projects — like trails, bike lanes, sidewalks, and walking paths — to promote energy-efficient and eco-friendly means of transportation," said state Rep. Madeleine Dean. "Providing healthier transportation options will help increase Pennsylvanian's quality of life by creating more active, livable, and forward-thinking communities." Next, make sure you have the proper gear — like a bike that matches your needs, a good helmet, and a small toolkit so you're prepared for flats and other minor breakdowns. Plan your route in advance, and do a test run in your car to look for any potential danger spots. Use our interactive statewide bike route map to see if any can be incorporated into your commute. Also, consider combining cycling with public transportation; Commuter Services of Pennsylvania offers information on combining biking and public transportation in Adams, Berks, Carbon, Cumberland, Dauphin, Franklin, Lancaster, Lebanon, Monroe, Perry, Pike, Schuylkill, and York counties. For more information on riding a bike in Pennsylvania, visit the Ride a Bike section of PennDOT's website. Follow PennDOT on social media — Facebook, Twitter, and Instagram​.